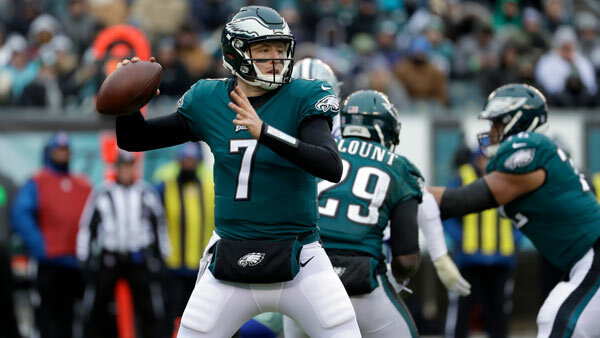 PHILADELPHIA (WPVI) -- Quarterback Nate Sudfeld made his Philadelphia Eagles debut on Sunday. In his first play, the 24-year-old backup QB threw a successful pass to Nelson Agholor for a four-yard gain in the second quarter of the game against the Dallas Cowboys in South Philadelphia. Sudfeld, a sixth-round pick by Washington in 2016, was inactive for 16 games his rookie season. The Eagles signed the Modesto, California native to the practice squad in September and promoted him to the active roster on November 1 after the Indianapolis Colts wanted to sign him. At Indiana University, Sudfeld set the all-time school record in passing yards and passing touchdowns. And it was Sudfeld who Carson Wentz FaceTimed after his ACL surgery. Wentz was inquiring about a new wrinkle in the playbook. "It's like the first question: 'So what's this new play I saw in the emails?'" Sudfeld said, adding that Wentz proceeded to order a double burger during the conversation. "I was like, 'You sure you want to know right now?' Classic Carson." Carson Wentz takes the field on crutches to support his teammates on December 31, 2017.